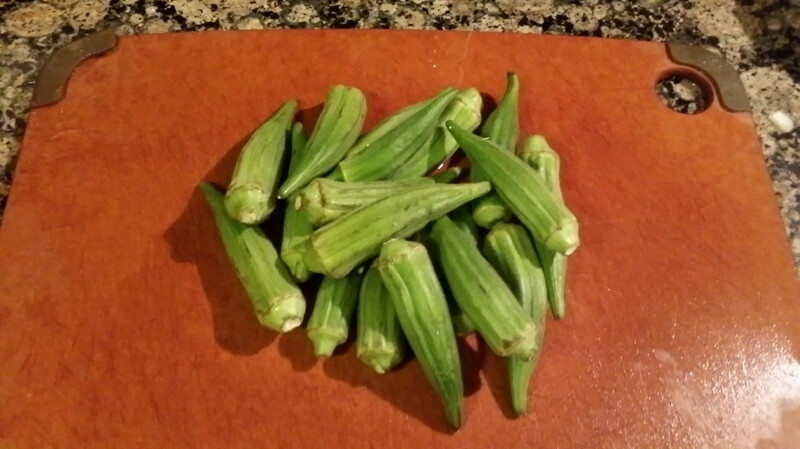 Growing up, I was never really a fan of okra. It was slimy and weird. My dad on the other hand, loved the stuff. Hence, my mom used to make it for him and we were forced to eat it. At some point in time, as with most of the stuff I didn't like in the past, I grew to like it. I remember a friend of mine who sauted okra and carrots with some herbs and spices. It was so good and crunchy that I fell in love with it immediately. 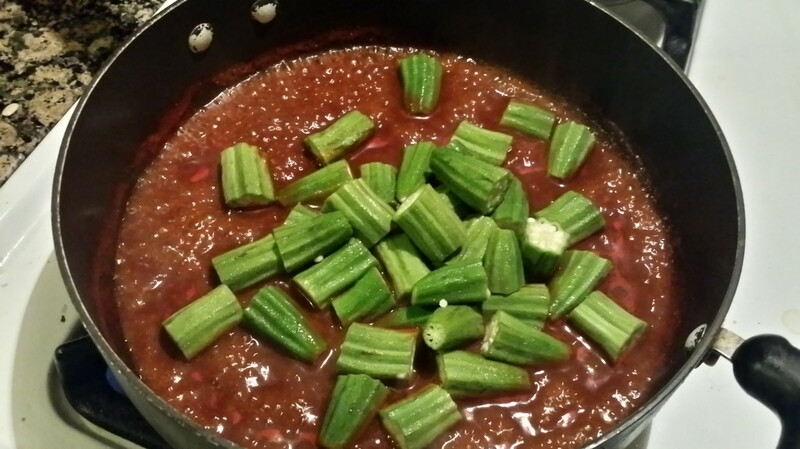 I had no idea that okra could be made that way because all I ever had growing up with the mushy, slimy, saucy kind. Then, I befriended a group of Africans who introduced me to okra draw soup with pounded yams. This was taking mushy and slimy to a whole new level and surprisingly, I loved it! 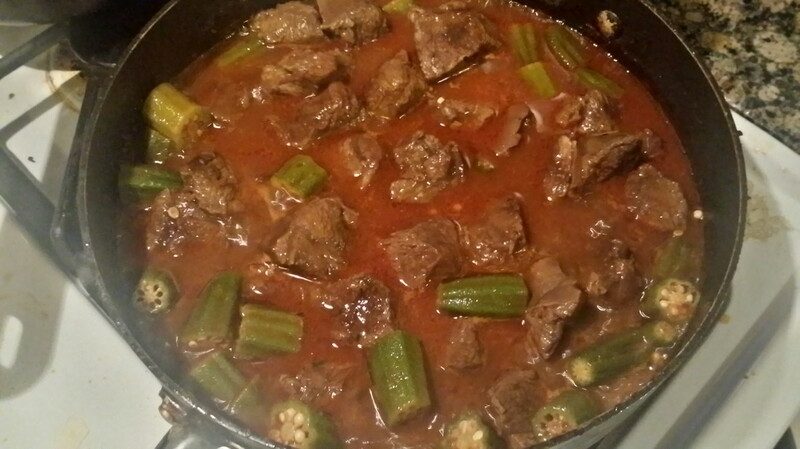 Anyway, back to this recipe: The okra in this is tender but not mushy. I also don't use enough to cause the sauce to be slimy. 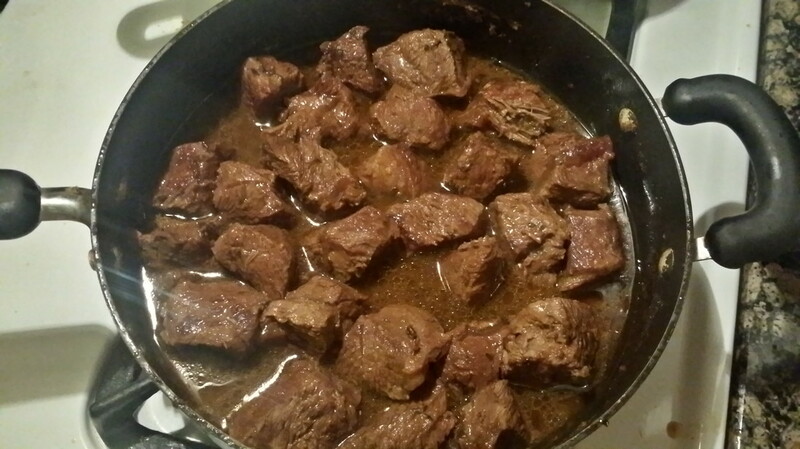 The beef is prepared almost the exact same way I prepare griot except that it's not fried. Either way, this is pretty good and we usually eat it with white rice and a little bit of "sos pwa". It does take time but I hope you give it a try. 1. 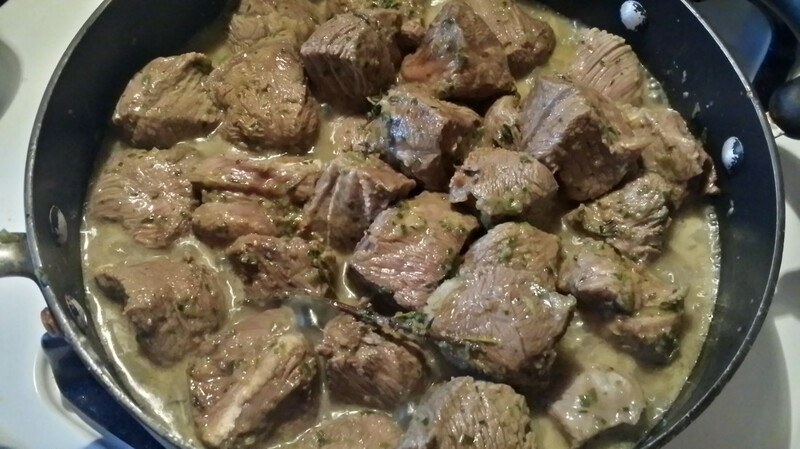 If you're using beef shoulder roast, trim off excess fat around the edges then cut meat into about 1 1/2 inch cubes. 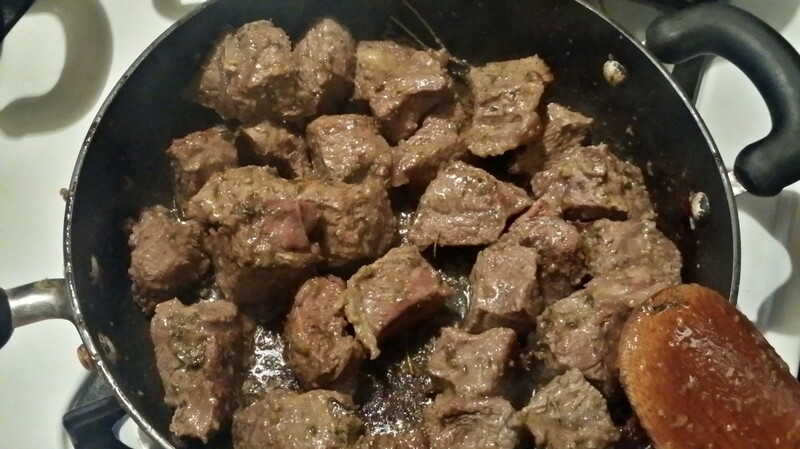 If you're using beef stew, start with step 2. 2. 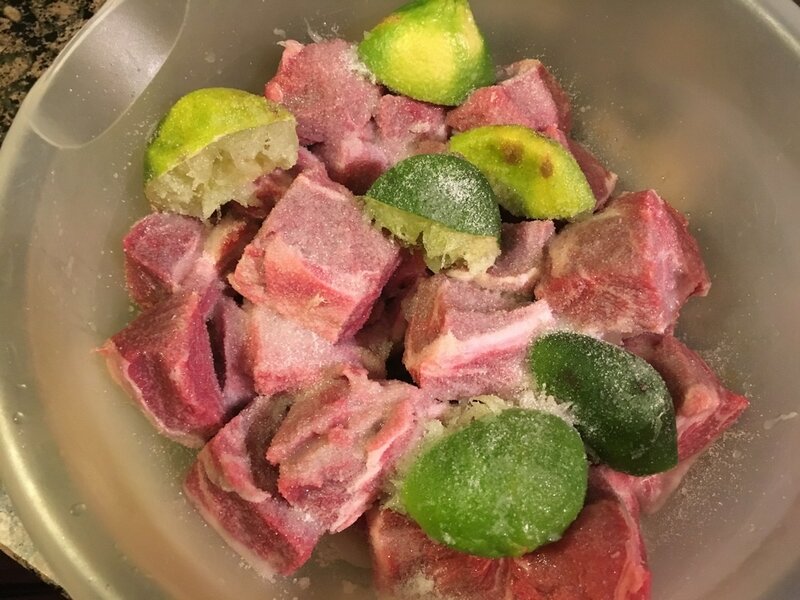 ​Place cubed meat in a large bowl and squeeze the juices of about 3 limes. Rub the meat thoroughly with them and leave the peels in the bowl. Add a generous amount of salt and enough water to cover the meat. Mix and let it sit for at least an hour. *Note: You can always substitute the limes for either lemons or sour oranges. You can also use the bottled concentrated version of them as well which come in a variety of brands. We just need something sour and citric for the cleaning process. Avoid using vinegar. According to one of my uncles, using vinegar on red meat will make it tough and will take longer for it to become tender in the cooking process. 3. 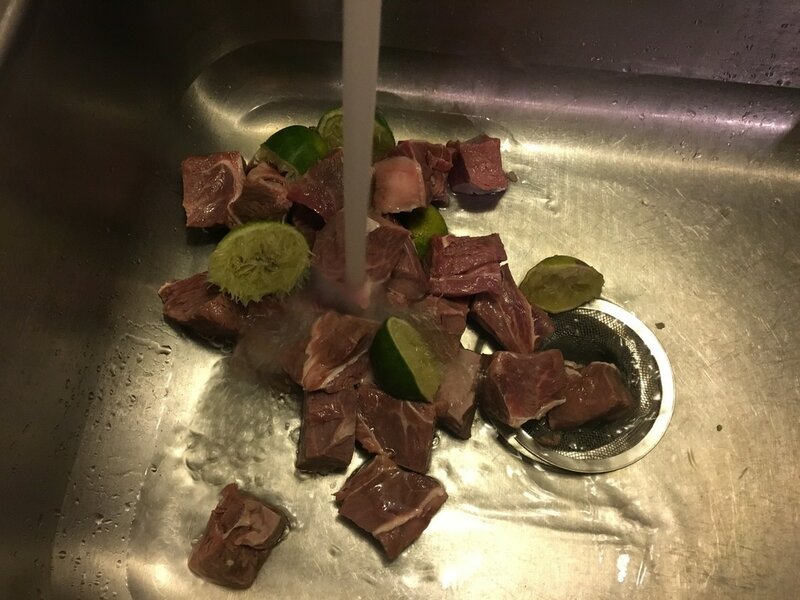 Afterwards, dump the contents into a clean sink and rinse off each piece of meat with cool running water, squeeze out any excess liquid, and return to bowl. ​Discard the skin of the limes. You will notice that the meat won't be as red as before. 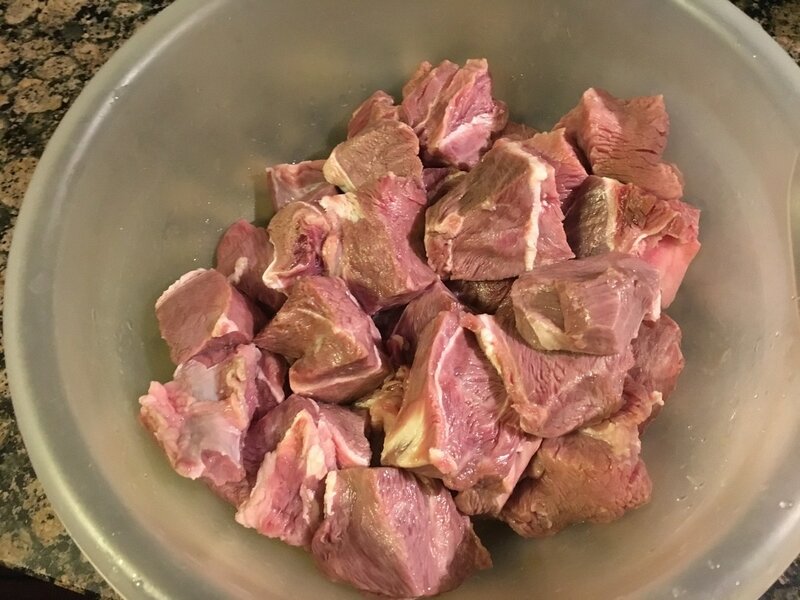 You can also refer to the "Cleaning Meat" page regarding this process. 4. 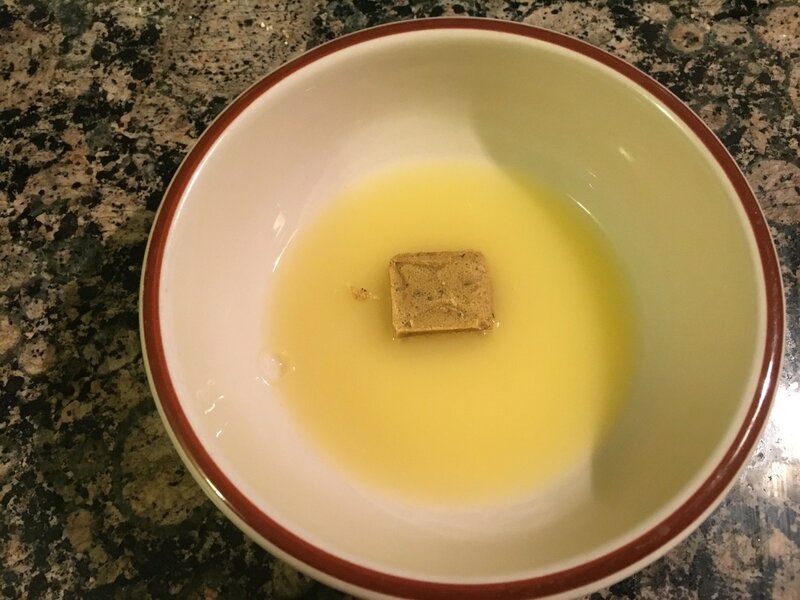 In a small bowl, add 1/4 a cup of juice squeezed from a sour orange and 1 Maggie chicken bouillon cube then microwave it for 30 seconds. Crush the cube to get it to dissolve in the liquid. As previously mentioned, you can use anything that is sour and citric (limes/lemons). I used a bottle of bitter orange marinade in this step since I ran out of fresh sour oranges. If desired, the Maggie can be crushed directly onto the meat with the sour orange on the next step. 5. 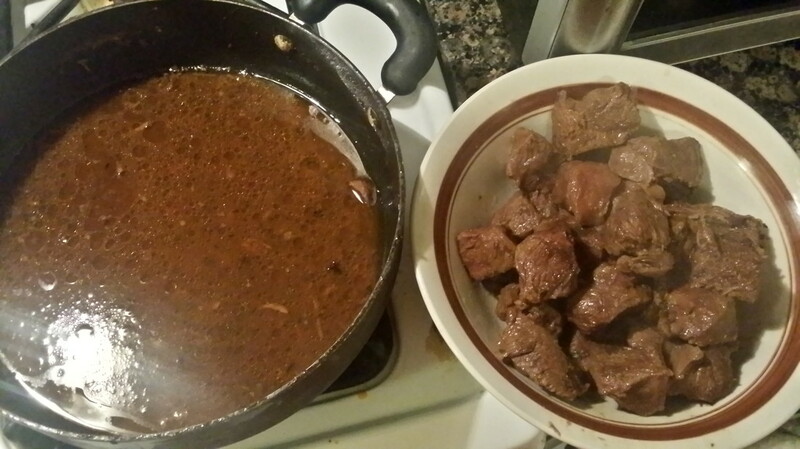 Pour the juice on the meat along with 3 tbsps. of epis, a couple sprigs of time, 5 - 7 cloves (jirof) and 1 tsp. of Adobo. Mix the contents thoroughly to fully distribute. 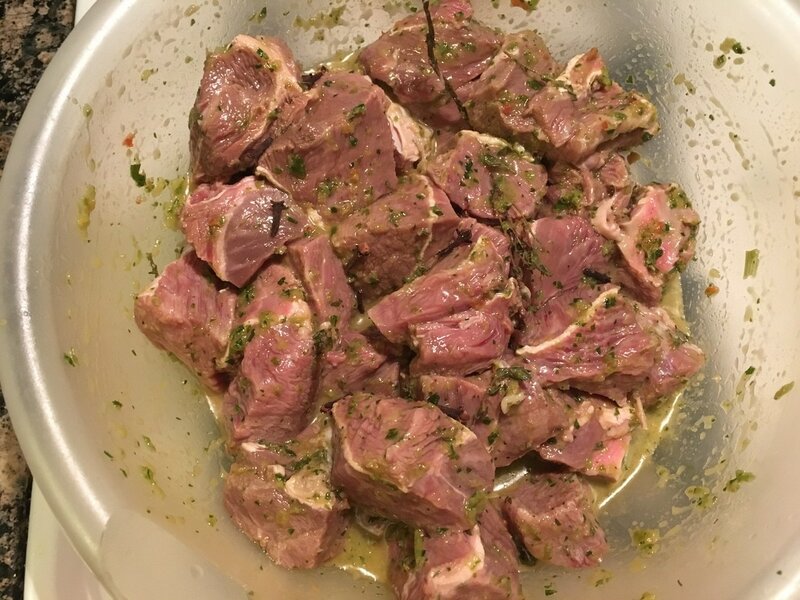 Refrigerate the marinated meat for at least 30 minutes or overnight. 6. 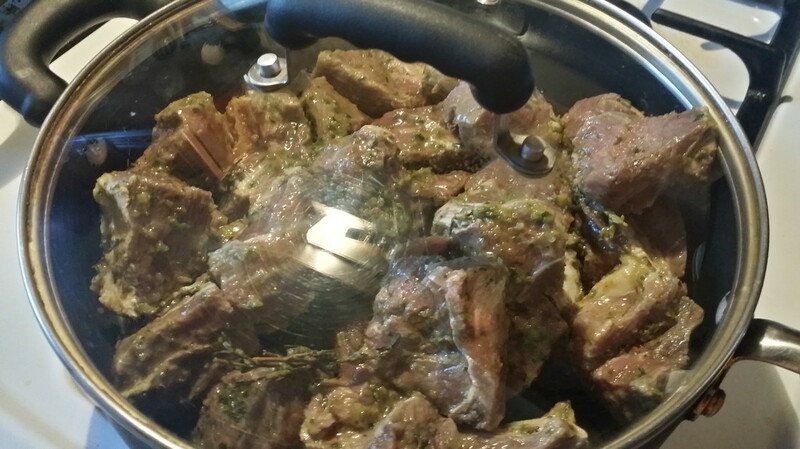 After marinating, transfer the meat into a pot with all the marinade liquid. Turn the heat on to high. Place the lid on the pot and let it boil for about 10 minutes. The meat will produce a lot of its own juices. After 10 minutes, stir contents and continue to let it boil with the lid covered until the liquid runs dry. This may take approximately another 10 minutes. 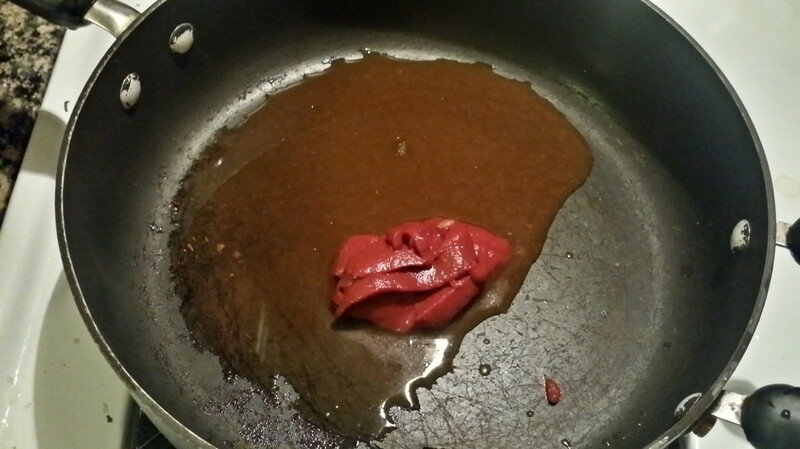 Once the liquid has fully evaporated, saute the meat for about 3 - 5 minutes in the oil it has rendered. This helps the meat develop a darker color. 7. 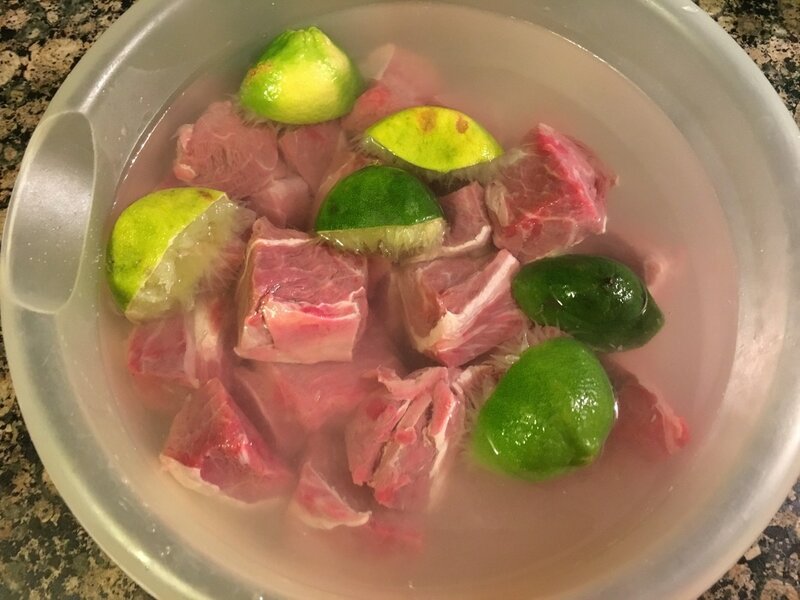 Add 2 cups of water (enough to cover the meat) and return to a boil. Replace lid and let it boil until the liquid runs dry once again, about another 10 - 15 minutes or so. When the water runs dry for a second time, add in another 2 cups and let it continue to boil. 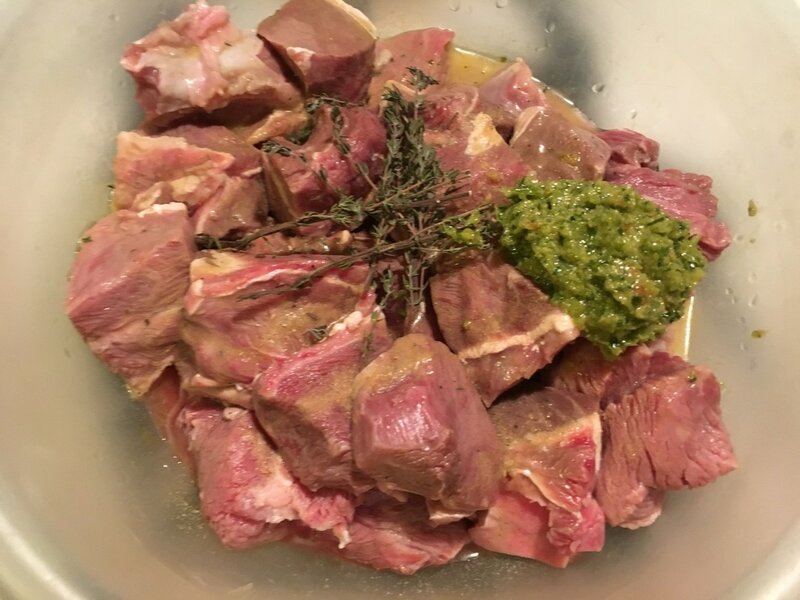 You will want to repeat this step until the meat is fully cooked and tender, approximately an hour (can be a little less or a little more time). By the time the meat is tender, there should still be some liquid left, not fully covering the meet but at least 1/2 way. If not, add in a little more water and let it boil for at least 5 minutes before proceeding to the next step. 8. 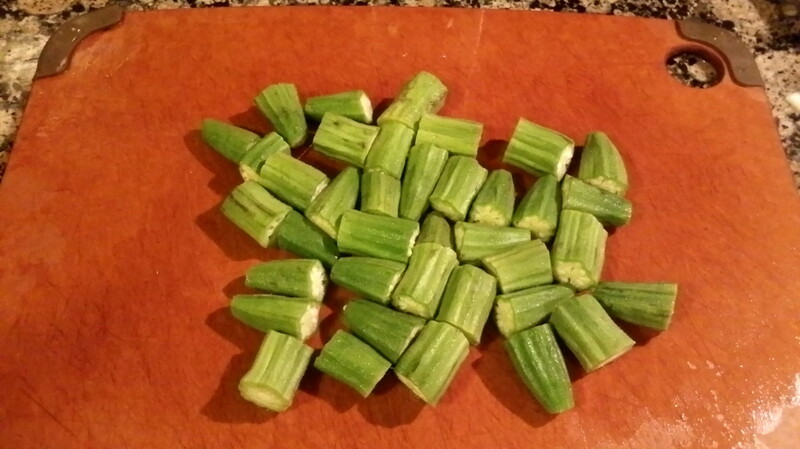 Meanwhile, as the beef cooks, prepare the okra to set aside. You will need it handy for step 11. 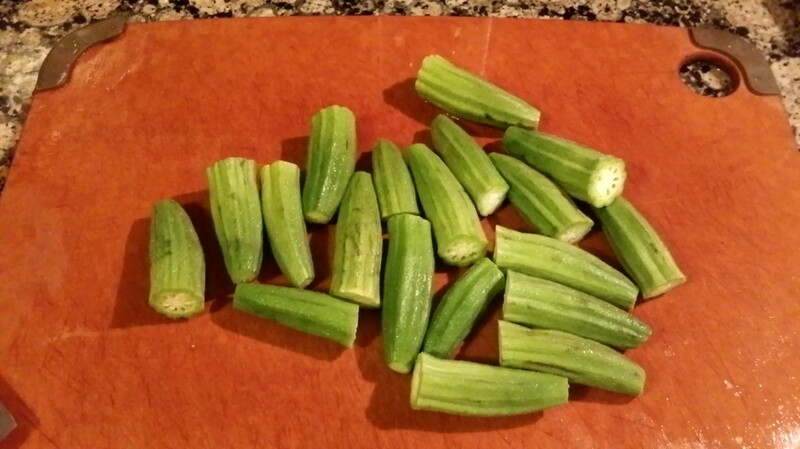 Wash the okra and cut off both ends. Then, cut them into 1/2 in pieces. 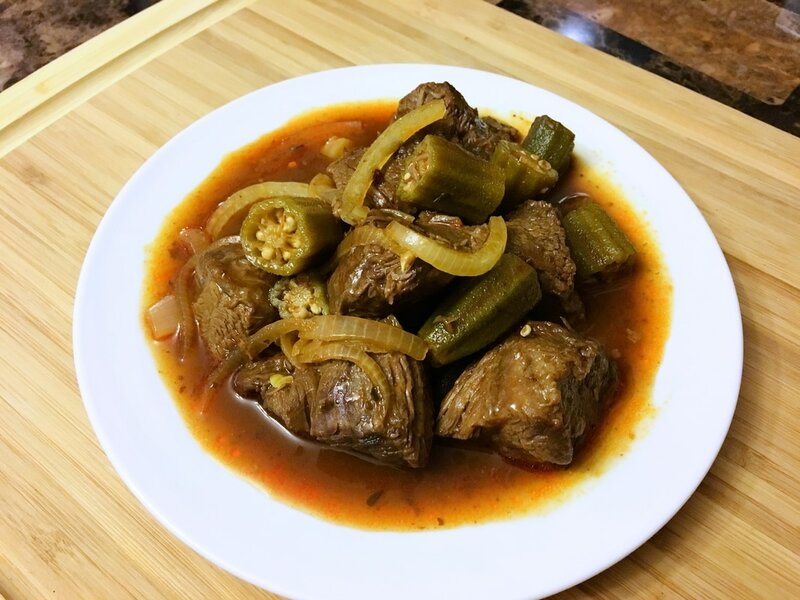 You should have anywhere from 1 - 2 cups of okra. 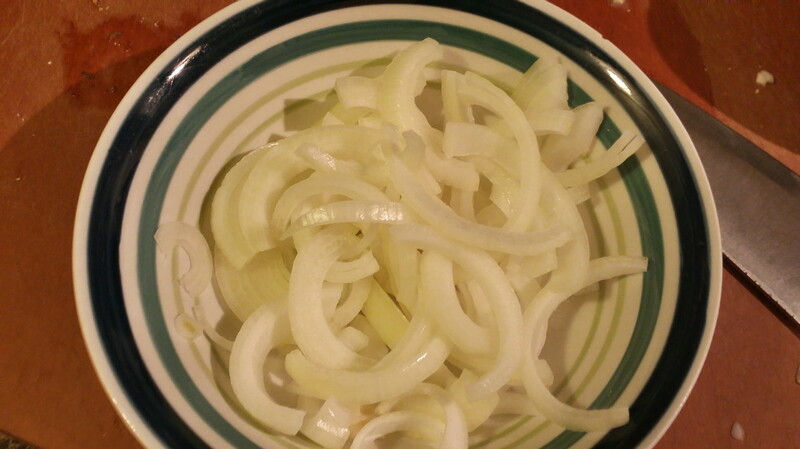 In addition, prepare 1 sliced onion and set that aside. 9. 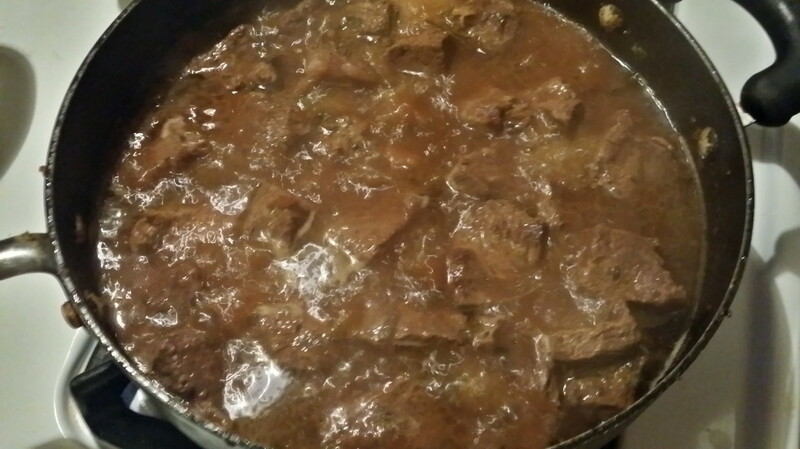 Remove the meat with a slotted spoon and set it aside. 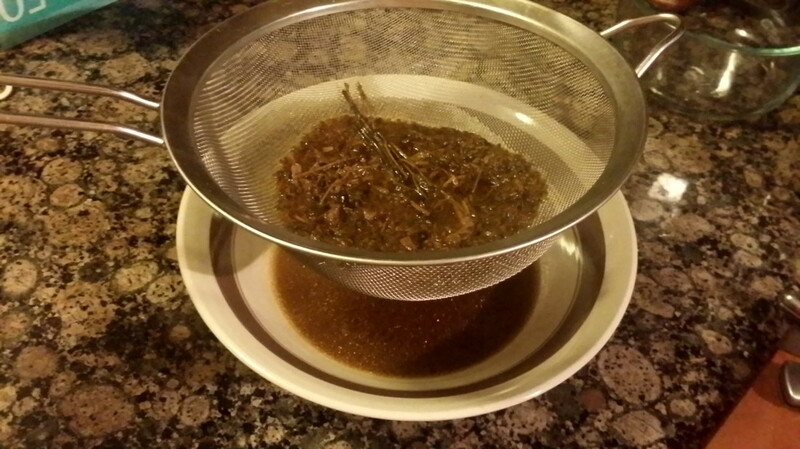 Strain the sauce with a fine wire mesh strainer and set the sauce aside. 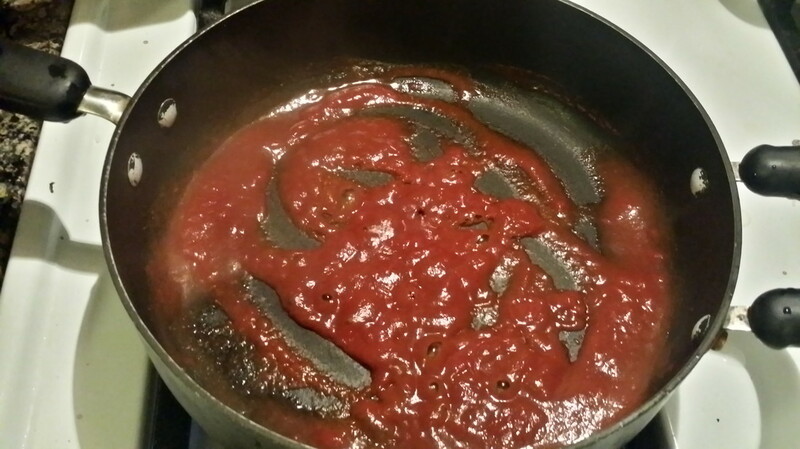 You can skip this step if you want but I like doing it this way in order to have a "cleaner" sauce. It will remove the twigs of thyme, cloves, extra fat and any other large particles. All the flavor remains in the liquid. 10. 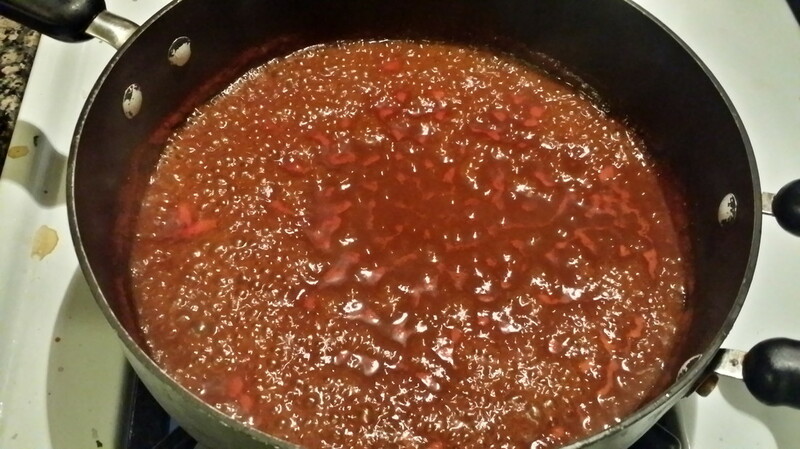 In the same pot, add about 1/4 cup of the strained liquid and 2 tbsps. of tomato paste. Saute on medium heat for about 2 minutes until it combines, the liquid dries, and the tomato paste starts to slightly darken. 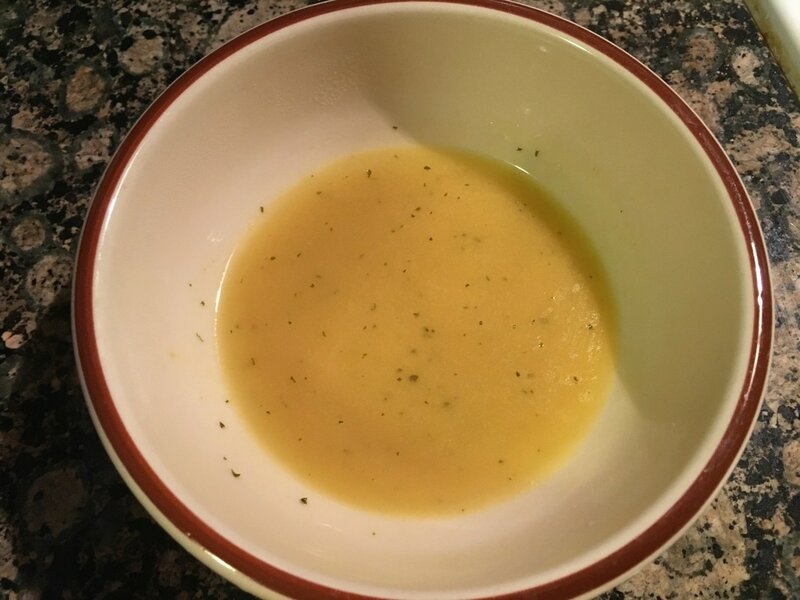 Add in a little more liquid at a time while stirring frequently until all the sauce has been added. *Note: The tomato paste is traditionally sauted in a bit of oil first, but I do it this way to cut back on the amount of oil used. 11. 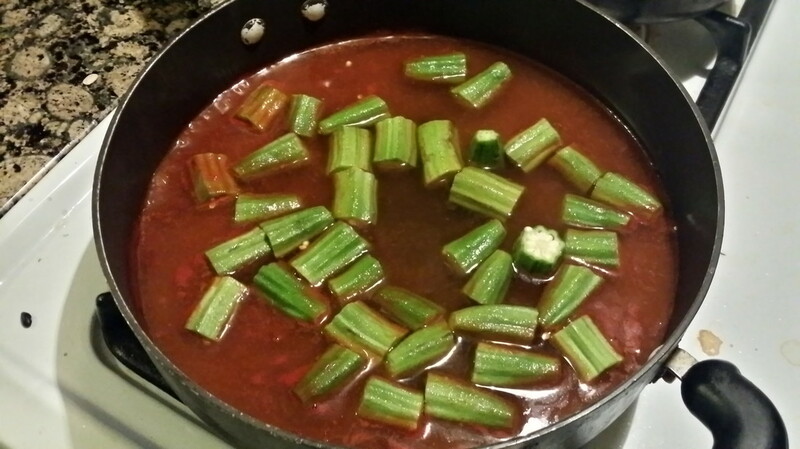 Add in the okra and about 1 1/2 - 2 1/2 cups of water, depending on how much sauce you want to make. Let it come to a boil. Add salt to taste. 12. 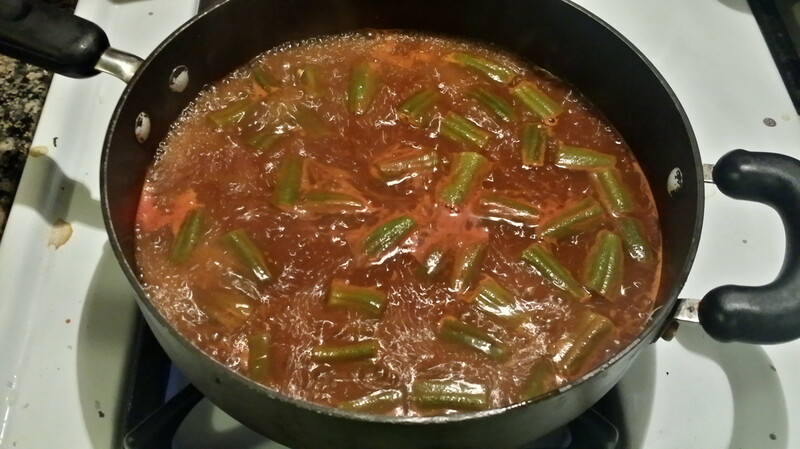 Let the okra boil for about 5 minutes before adding the meat back to the pot. 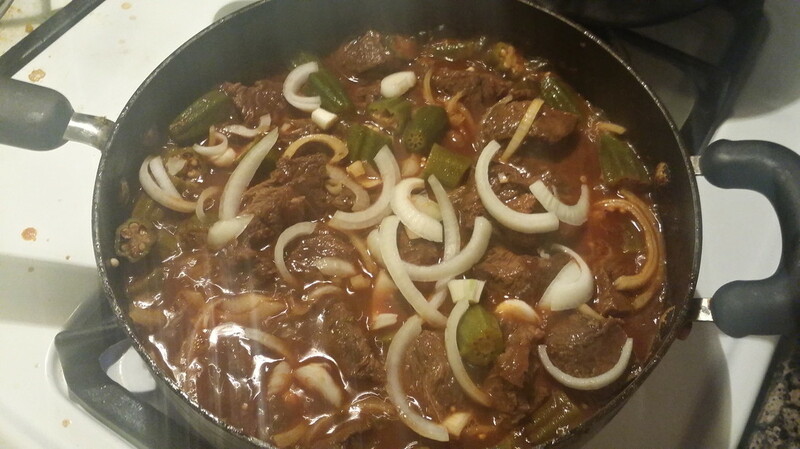 Then, cook for another 5 minutes or until the okra reaches your desired tenderness. Once complete, top it off with 1 sliced onion and turn off the heat. The onions will cook down a bit from the residual heat but still retain a slight crunch. If you prefer the onions to cook down more, then boil in the sauce for a couple minutes before turning off the heat. Afterwards, your sauce is ready to be served. This accompanies a side of white rice very well. What do you think of this recipe? What other vegetables do you make beef stew with?